With the temperatures set to fall this week you might, like me, be reaching for your knitwear. I’m the sort of person who feels the cold and is to be found turning up the thermometer at home (only for it to be turned down again by my husband … it becomes quite a ‘game’ in our house!). Knitwear comes in an array of colours and whilst it might be easy to pick up another black jumper, ask yourself whether it actually suits you (and whether you need it if you’ve already got a drawer full of them!). Black is a dark and cool colour so it will look lovely on you if you have those same characteristics in your colouring, but it can make those with lighter, warmer or smokey colouring, for example, look tired and washed out. If neutrals are a favourite, then a lighter grey will flatter lighter colouring, a warm brown or camel for those with warmer colouring and a medium depth grey, like charcoal, for those with smokey/soft colouring. Or what about choosing a colour that isn’t a neutral colour? There are some lovely burgundies, pinks, blues, reds, browns, mustards around at the moment. I love a bargain so as it’s Black Friday week, I’ve created a series of Pinterest boards, one for each colouring type (Light, Deep, Warm, Cool, Bright/Clear and Smokey/Soft) with a selection of knitwear that has been reduced in a sale or Black Friday offer. I’ve included a selection below but for the full range, simply visit my Pinterest account: kerrielellis. (I’m sure these offers won’t hang around for long and sizes will sell out fast, so I’d urge you to get shopping quickly!). If you feel the cold and are looking for a real favourite laying piece of mine – the roll neck – then you need look no further. Kettlewell Colours have them in 30 colours! Place your order through me and I can offer you a discount too! (Click here to email me for details and to place your order). 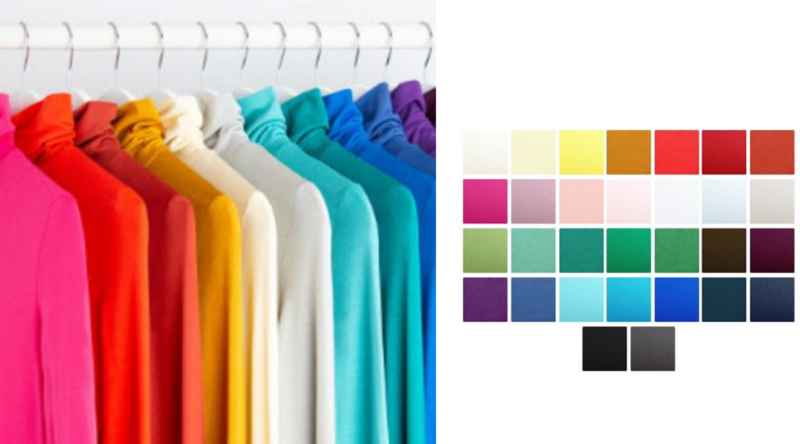 Roll Necks in 30 Colours! If you’re unsure of your colouring type and the colours that suit you, why not book a colour consultation. It’ll save you time and money in the future (no more lengthy shopping trips being overwhelmed by the choices out there, or money spent on items that stay in your wardrobe unworn), plus you’ll feel so confident, knowing that what you are wearing really suits you. Click here for details of the colour consultations I offer. The weight, texture and voluminous nature of knitwear you choose can make a real difference to the way you look and feel. If you are petite in height and/or finer in scale (bone structure), then you may well be overwhelmed in chunkier knits, knits with lots of different textures/weaves and those that are too voluminous (like batwings and cocoon styles). It can end up looking like the knitwear is wearing you rather than the other way around! You are much better choosing finer knits with little texture and in styles that follow your silhouette rather than those that are voluminous, so that they don’t swamp you. Conversely, if you are tall and/or of grand scale, then the heavier weight knits, those with more texture and those that are more voluminous will be flattering. (A word of warning to you though if you are grand in scale but petite in height – too much volume won’t work, your best bet is to dress for your height rather than scale when it comes to knitwear). Pattern is often a ‘marmite subject’, you’ll either love it or hate it! If it’s not your thing, then simply stick to knitwear in block colours from your colouring palette. If you enjoy wearing patterns, then the same general advice applies as it does to weight, texture and volume – you will always look best choosing patterns in a size that is in keeping with your height and scale. So if you are petite then choose smaller patterns, and if you are taller/bigger in scale then the medium to larger patterns will be more flattering. Your shape will make a difference to the type of pattern that suit you too. Curvier shapes generally look best in fluid patterns like swirls and florals, for example, whereas straighter shapes look fabulous in geometric shapes like stripes, checks and the like. That’s not to say that a horizontal striped jumper won’t suit you if you are curvier, just be mindful to check that the stripes don’t ‘kink’ over your curves or add unwelcome breadth! If you’d like help choosing your knitwear, or any other item of clothing, then I’d love to help you! I am passionate about helping people to feel good about themselves, and knowing that your clothes flatter you and feel like ‘you’ is a great way to do just that. So whether you want a one-off consultation to advise you of the colours or styles of clothes that suit you, or you’d like me to do some online shopping for you and suggest styles that would suit you, or you’d like me to go through your wardrobe with you and help you to create outfits that make getting dressed each day easier, then give me a call – 07917 663330 or check out my website.